P(1) The principles and rules given in this section complement those given in 4.3.2. They are concerned with punching shear in slabs containing flexural reinforcement determined according to 4.3.1; they also cover punching shear in foundations and waffle slabs with a solid section around the "loaded area". P(2) Punching shear may result from a concentrated load or reaction acting on a relatively small area, called the "loaded area", of a slab or of a foundation. (3) An appropriate design model for checking punching shear failure at the ultimate limit state is shown in Figure 4.16. P(4) The shear resistance shall be checked along a defined critical perimeter. Outside the critical perimeter the slab has to satisfy the requirements of section 4.3.2. (5) In slabs subjected to punching shear an enhancement of shear resistance in accordance with Equation (4.17) should not be carried out. In foundation slabs, the applied shear may be reduced to allow for the soil reaction within the critical perimeter. P(6) The flexural strength of the slab shall also be checked independently in accordance with 4.3.1. P(7) If the thickness of a slab or foundation is not sufficient to ensure adequate punching shear resistance, shear reinforcement, column heads or other types of shear connector shall be provided. (8) The rules in this section also apply to waffle slabs with a solid section around the loaded area provided that the solid area extends at least 1.5d beyond the critical perimeter. (9) The amount of longitudinal tensile reinforcement in two perpendicular directions, x and y should be greater than 0.5 %, calculated allowing for any differences in effective depth in the two directions. (10) The force component parallel to Vsd due to inclined prestressed tendons placed inside the critical area may be taken into account according to 4.3.2.4.6.
d) The loaded area is not so close to other concentrated forces that their critical perimeters intersect — nor in a zone subjected to significant shear forces of a different origin. (1) The critical perimeter for circular or rectangular loaded areas located away from unsupported edges is defined as a perimeter surrounding the loaded area and at a defined distance from it. It is assumed to be 1.5d. See Figure 4.18. (2) For loaded areas situated near openings, if the shortest distance between the perimeter of the loaded area and the edge of the opening does not exceed | 6_d |, that part of the critical perimeter contained between two tangents drawn to the outline of the opening from the centre of area of the loaded area is considered to be ineffective. See Figure 4.19. (3) For a loaded area situated near an unsupported edge or a corner, the critical perimeter should be taken as shown in Figure 4.20, if this gives a perimeter (excluding the unsupported edges) less than that obtained from (1) and (2) above. 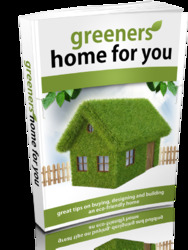 (4) For loaded areas situated near or on an unsupported edge or near or on a corner, i.e. at a distance less than d , special edge reinforcement along the edge is always required, (see 5.4.3.2.4). (1) The critical area is the area within the critical perimeter. (1) The critical section is the section which follows the critical perimeter and extends over the effective depth, d. For slabs of constant depth, the critical section is perpendicular to the middle plane of the slab. For slabs of variable depth (e.g. 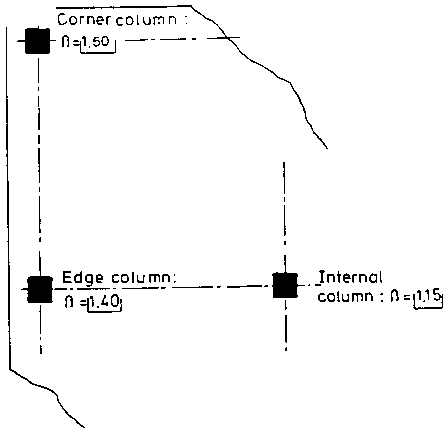 the foundation slab in Figure 4.16), it is assumed to be perpendicular to the tension face. VRdi — the design shear resistance per unit length of the critical perimeter, for a slab without shear reinforcement. VRd2 — the maximum design shear resistance per unit length of the critical perimeter, for a slab with shear reinforcement. VRd3 — the design shear resistance per unit length of the critical perimeter, for a slab with shear reinforcement. Vsd is the total design shear force developed. In a slab this is calculated along the perimeter u. 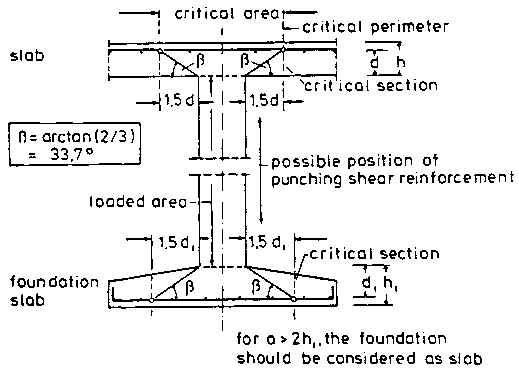 For a foundation this is calculated along the perimeter of the base of the truncated punching shear cone, assumed to form at 33.7°, provided this falls within the foundation. u is the perimeter of the critical section.
" is a coefficient which takes account of the effects of eccentricity of loading. In cases where no eccentricity of loading is possible, " may be taken as 1.0. In other cases, the values given in Figure 4.21 may be adopted. Based on a more rigorous analysis, other values for " may be used, when associated with appropriate methods for ensuring the anchorage of the reinforcement at the edge of the slab. What part of footing is critical in punching shear? How to check punching resistance for circular foundation? What is the punching shear perimeter in the foundation? How to find critical perimeter in foundation design with axial load from circular column to EC2? How to calculate the critical shear perimeter in reinforced concrete design? How does area within shear perimeter add to shear resistance in footings? How to calculate cretical perimeter distnce concrete? How to check if a concrete section is adequate to resist punching? How to calculate punching shear in pad foundation? Why punching shear failure consider in footing design? How to find the critical perimeter of a pad footing? How to calculate perimeter of punching shear for a rectangular footing? How to calculate the critical perimeter for punching shear? How to calculate punching shear control perimeter in foundation slideshare? How to calculate the area within the critical perimeter of a column base? 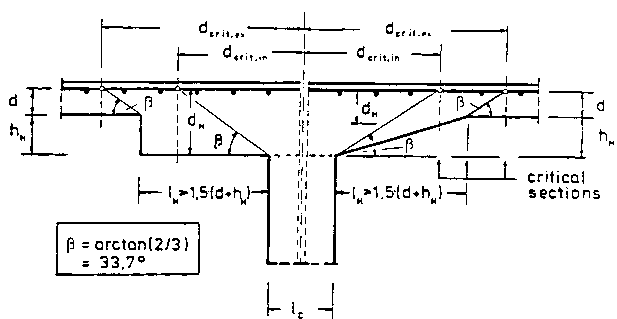 How to calculate critical section outside slab shear reinforcement?